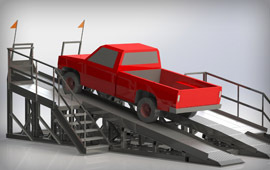 Engineering of a lifting platform for 10 ton heavy trucks including drawings and Alberta certification. 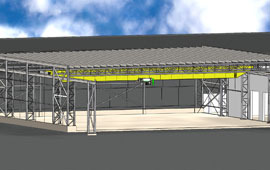 Certification of a 360 degree, 10TM, 20’ span in partnership with the manufacturer. 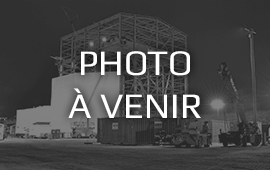 Project management and structural analysis for the addition of a structure consisting of a self-supporting side and a side attached to the modified building. All plans were created and certified by IMS Solution. 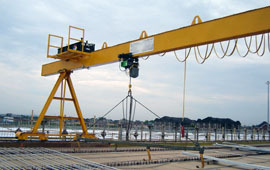 Custom Crane 2 x 45Tm, 75’-0” span, including box girders, custom end-truck, walkway and lifting plane. Several similar bridges were also made. 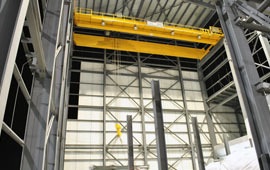 Engineering for a building with a 12T crane with a 90′-0 ” span. 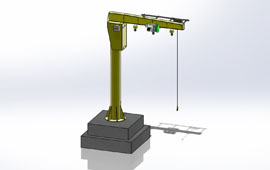 2 500kg motorized gantry with an adjustable span (12m-15m). 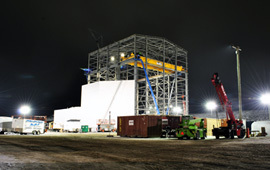 This gantry was required to support (using wheels of a minimal width) a load, to be easily assembled and dismantled at the construction site and to provide an adjustable span between 12 and 15 meters.